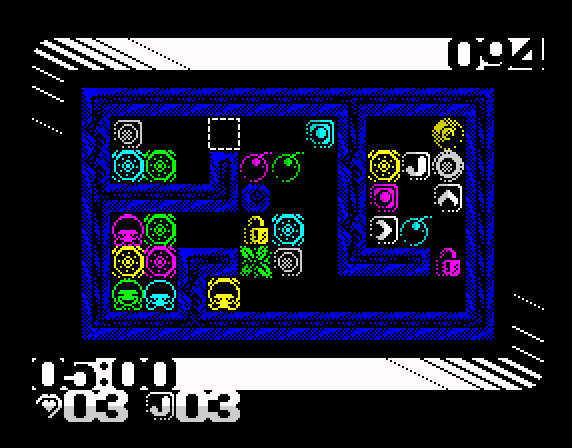 This is a brain-scrambling puzzler of 101 increasingly fiendish levels where where the aim is to guide each Speccy to its correspondingly-coloured home pad. 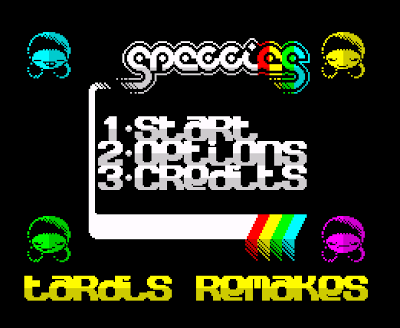 The main issue with doing so is that once you direct a Speccy to roll in a particular direction, it won't stop until it hits an obstruction. This unfortunate characteristic means that more often than not your Speccies will have to take the long way round to get to their intended destination, or that other Speccies will need to be creatively positioned to block their path. It's tricky to get your head around to start with, so thankfully the first 20 or so levels are fairly straightforward. But after that I guarantee you will be scratching your head at regular intervals. 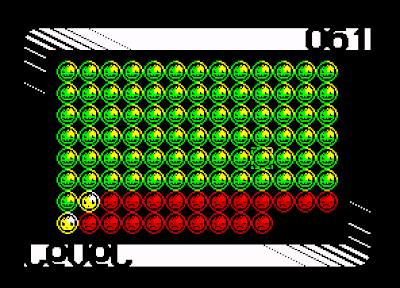 Although each level is only one screen in size, a huge number of obstacles get packed in, especially in the later stages. These include bombs, bouncers, direction arrows, teleporters, locks and switches. It really gets complex as the switches and locks are colour-coded so they can only be opened or activated by a Speccy of the same colour. Considering that you also have to contend with a tight time limit and that you can have up to eight Speccies (two of each colour) to guide home in each level, you really are up against it. Having said that, I found that once I got the hang of it I rarely got stuck on any one level for too long, so it didn't become too frustrating. The size of the game certainly means it can't be completed in one sitting, so I would have ideally liked to have seen some sort of password system to save your progress. (Yes, I know we all know how to take an emulator snapshot, but what about those of us who are playing on an actual, real-life Spectrum?) If you die, the game will allow you to restart from the same level and will remember which levels which you have completed - some good brownie points earned here! Also, you are allowed to play any of eight levels (0, 13, 26, 39, 52, 65, 78, 91) from the start; as you complete them the next level will be unlocked. This non-linear, multi-route structure means you are unlikely to get irretrievably stuck and you can get a taste of a much harder challenge once you learn the ropes. Judging from Tardis' website, the level designs have been faithfully recreated from the original, but for me, the level designs could have been significantly tighter. It's the kind of game where there are many potential solutions to each level, and actions don't often need to be performed in a strict order. But my favourite levels were some of the later ones where one false move could mean failure, and you had to really think carefully about which Speccy to move next. I would have liked more of the same, and to have been tested a little more sternly, as the difficulty level does plateau somewhat in the second half of the game. 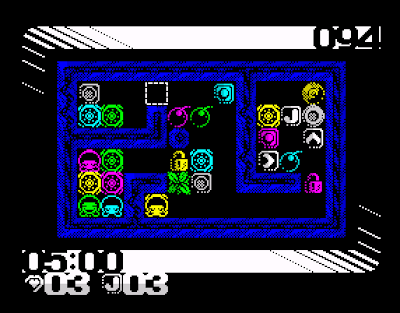 There's a cracking title tune, despite the 48k Spectrum's audio limitations, and the graphical design is really neat. The levels might have looked boring, but Tardis have averted this with some nice touches like the Speccies' smiley animations that are triggered whenever you move them over their home pads. 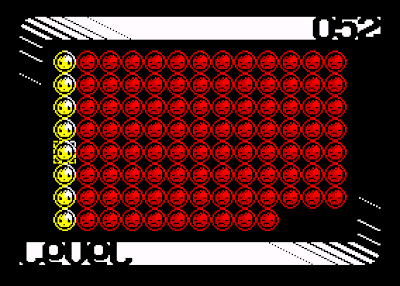 There is even an alternative palette in ULAPlus mode, which caters for people who suffer from colour-blindness. The game is only let down in terms of presentation by an odd choice of semi-legible font on the menus, and some shoddy looking text on the 'game over' and 'level complete' screens. 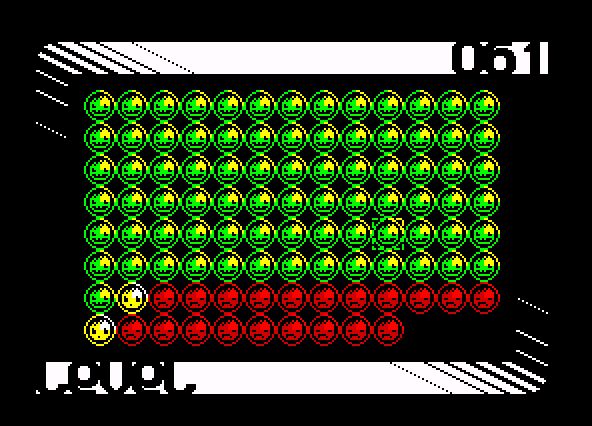 It's fun and challenging, and each level has a nice tight time limit to keep you on your toes. The control system for selecting and moving the Speccies works seamlessly, which is essential in a game of this nature as the clock ticks down. There are flexible routes through the game to keep you interested and it's pretty darn addictive too, so prepare for some late bedtimes if you decide to give it a go - and I recommend that you do! Download the game here (from the Tardis Games website).